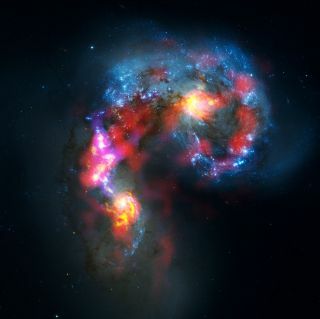 A combined view of the Antennae Galaxies, taken by the ALMA radio telescope array and the Hubble Space Telescope. After years of planning, construction and assembly, a gigantic observatory billed as the world's most complex array of ground-based telescopes has opened its eyes in South America and captured its first image. The Atacama Large Millimeter/submillimeter Array, or ALMA, is now officially open for business high in the Chilean Andes. The huge $1.3 billion radio telescope, a collaboration of many nations and institutions, should help astronomers explore some of the coldest and most distant objects in the universe, researchers said. To mark the moment, scientists released an early image snapped by ALMA. It shows the Antennae Galaxies (also known as NGC 4038 and 4039), a pair of colliding spiral galaxies found about 70 million light-years away in the constellation Corvus (The Crow). ALMA imaged the two galaxies in two different wavelength ranges during the observatory's early testing phase, researchers said. Future images will be much sharper, they added, as more antennas in the array come online. ALMA is a complex of 40-foot (12-meter) radio telescopes sitting at an elevation of 16,500 feet (5,000 m) on the Chajnantor plateau in northern Chile. These individual antennas each pick up light in the millimeter/submillimeter range — about 1,000 times longer than visible-light wavelengths. Observing in these long wavelengths will allow ALMA to detect extremely cold objects, such as the gas clouds from which stars and planets form, researchers said. The observatory should also be able to peer at very distant objects, opening a window in the early universe. The individual telescopes in the ALMA array are spread out over considerable distances, but they'll work as a team. A supercomputer working at 17 quadrillion operations per second will assemble each antenna's observations, forming one large view. Currently, the array harbors 19 individual telescopes, though 66 should come online by 2013, researchers said. The array will ultimately be about 11 miles (18 km) wide. Still, nearly 20 huge radio antennas are enough to start observing the universe. And ALMA just began doing that officially on Friday (Sept. 30), when the telescope kicked off its nine-month "Early Science" phase. This picture of the ALMA radio antennas on the Chajnantor Plateau in Chile, 16,500 feet above sea level, was taken a few days before the start of ALMA Early Science operations. Nineteen antennas are on the plateau. ALMA received more than 900 applications to use the telescope during the Early Science stage, suggesting that astronomers are eager to break in the new tool. The observatory could take on 100 of these projects, so a lot of science could get done in the next nine months. "With millimeter and submillimeter waves, we can watch planet formation, investigate astrochemistry and detect the light that is finally reaching us from the universe’s earliest galaxies," said Alison Peck, an NRAO astronomer serving as ALMA deputy project scientist during construction. "ALMA’s first projects will flex the telescope’s capabilities in all of these fields and many, many more." The ALMA radio telescope array in Chile captured this shot of the Antennae Galaxies, which are about 75 million light-years from Earth. This is the first ALMA image to be released to the public. Construction of ALMA will continue during the Early Science phase of observations, researchers said. The observatory is a partnership involving Europe, Japan and North America, in cooperation with Chile. ALMA is funded in Europe by the European Southern Observatory, in Japan by the National Institutes of Natural Sciences in cooperation with Taiwan's Academia Sinica, and in North America by the U.S. National Science Foundation in cooperation with the National Research Council of Canada and the National Science Council of Taiwan.